Kay Rasmus Nielsen was a Danish illustrator who was born on 12th March 1886. He was incredibly popular in the early twentieth century, as a key artist in the ‘Golden Age of Illustration’ sweeping across the world. Kay Rasmus Nielsen was a Danish illustrator who was born on 12th March, 1886. He was incredibly popular in the early-twentieth century, as a key artist in the ‘Golden Age of Illustration‘ sweeping across the world. 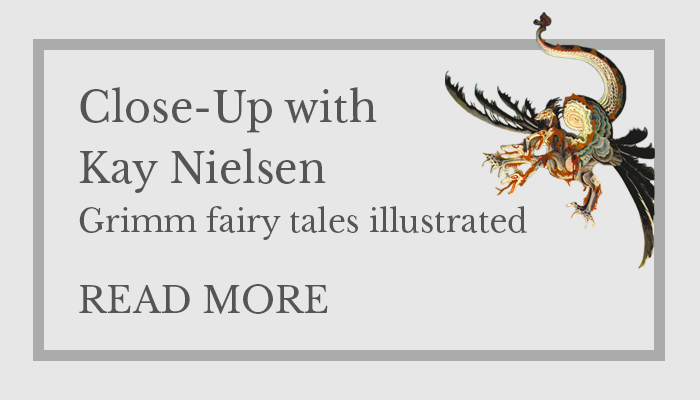 Nielsen joined the ranks of Arthur Rackham and Harry Clarke in enjoying the success of the burgeoning gift-book market at this time, and is also remembered for his pioneering collaborations with Disney – for whom he contributed many story sketches and illustrations. 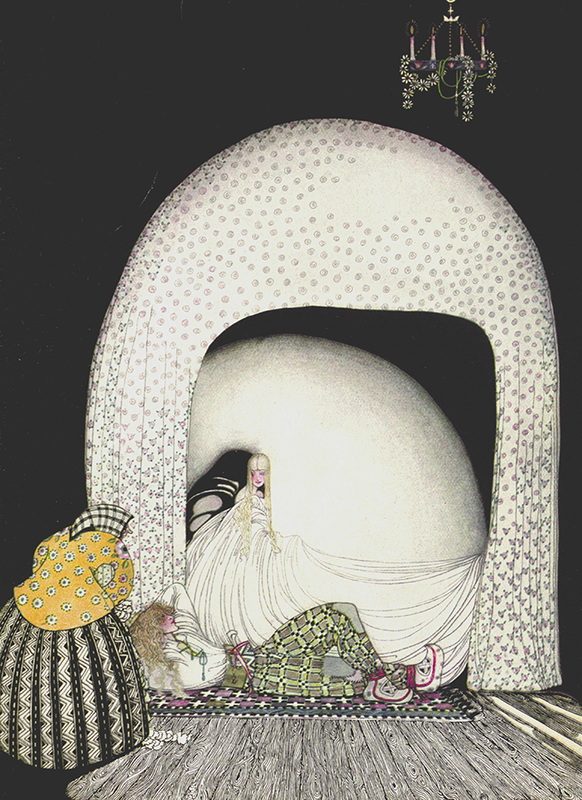 Kay Nielsen was born in Copenhagen into an artistic family. Both of his parents were actors – Nielsen’s father, Martinus Nielsen, was the director of Dagmarteater, and his mother, Oda Nielsen, was one of the most celebrated actresses of her time. Nielsen studied art in Paris at the Académie Julian and Académie Colarossi from 1904 to 1911, and then lived in England from 1911 to 1916. He received his first English commission from ‘Hodder and Stoughton’ to illustrate a collection of fairy tales. 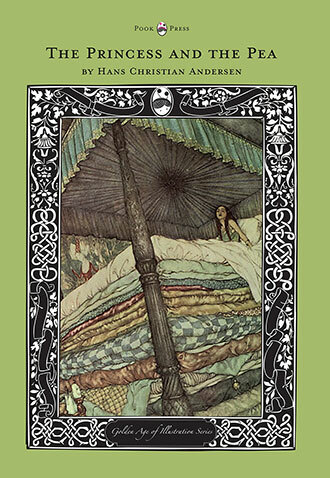 This was Nielsen’s ‘big break’ and he provided twenty-four beautiful colour plates and more than fifteen monotone illustrations for In Powder and Crinoline, Fairy Tales Retold by Sir Arthur Quiller-Couch (published in 1913). In the same year, Nielsen was also commissioned by The Illustrated London News to produce a set of four illustrations to accompany the tales of Charles Perrault. 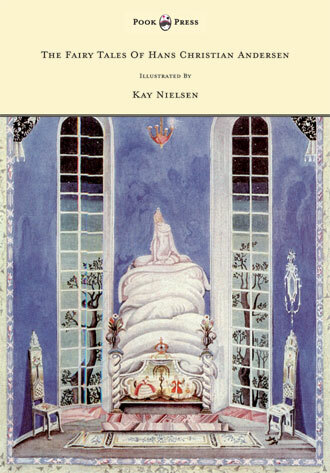 Nielsen’s illustrations for ‘Sleeping Beauty‘, ‘Puss in Boots‘, ‘Cinderella‘ and ‘Bluebeard‘ were published in the 1913 Christmas Edition, to great critical acclaim. 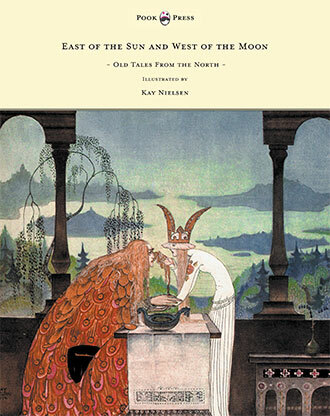 A year later, in 1914, Nielsen provided twenty-five colour plates and more than twenty-one monotone images for the children’s collection East of the Sun and West of the Moon. 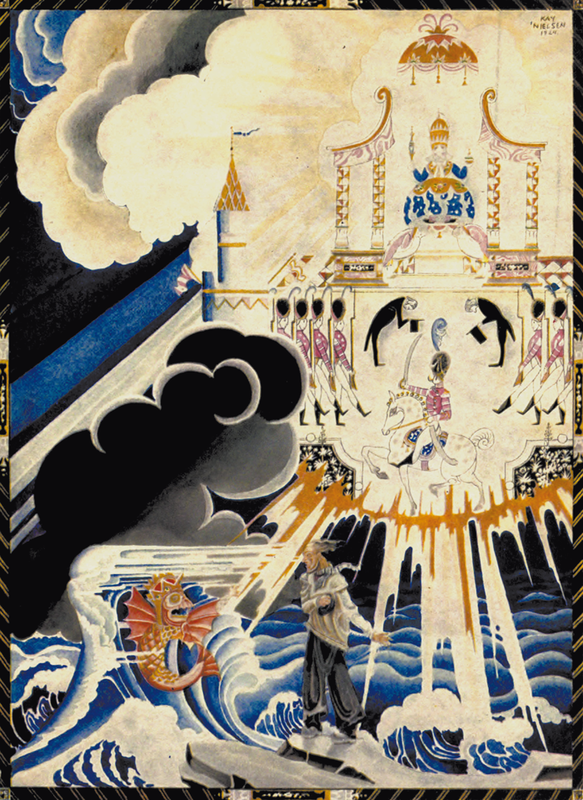 Also in that year, Nielsen produced at least three illustrations depicting scenes from the life of Joan of Arc, accompanying the text of The Monk of Fife (published in 1920). The colour images for both In Powder and Crinoline and East of the Sun and West of the Moon were reproduced by a 4-colour process, in contrast to many of the illustrations prepared by his contemporaries that characteristically utilised a traditional 3-colour process. This instantly set Nielsen apart, and in 1917, he left for New York where an exhibition of his work was held. This was a massive achievement for a relatively new illustrator, and after this success, Nielsen returned to Denmark. Together with a collaborator, Johannes Poulsen, he painted stage scenery for the Royal Danish Theatre in Copenhagen. 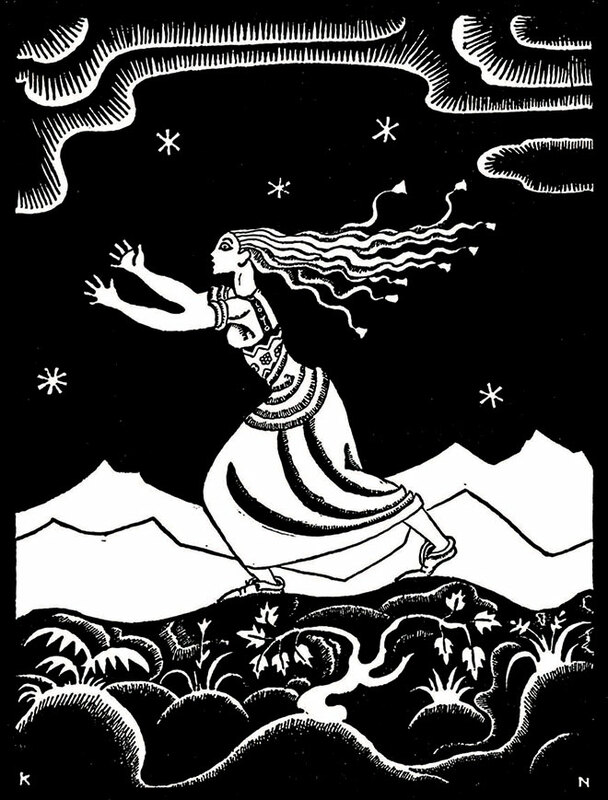 During this time, Nielsen also worked on an extensive suite of illustrations intended to accompany a translation of Scheherazade’s Arabian Nights (otherwise known as One Thousand and One Nights, first published in English in 1706) that had been undertaken by the Arabic scholar, Professor Arthur Christensen. 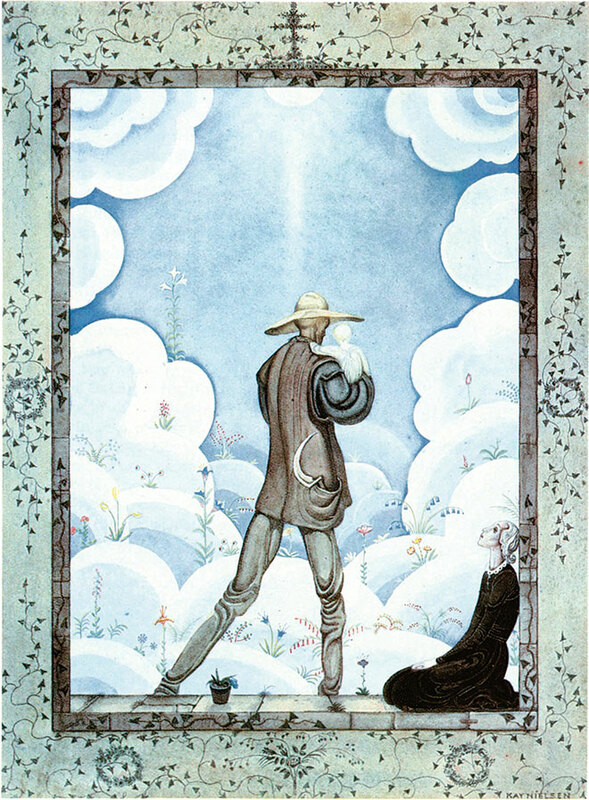 According to Nielsen’s own published comments, these illustrations were to be the basis of his return to book illustrations following a hiatus during World War One. However, the project never came to fruition and Nielsen’s illustrations remained unknown until many years after his death. The Fairy Tales of Hans Christian Andersen, Kay Nielsen, 1924. 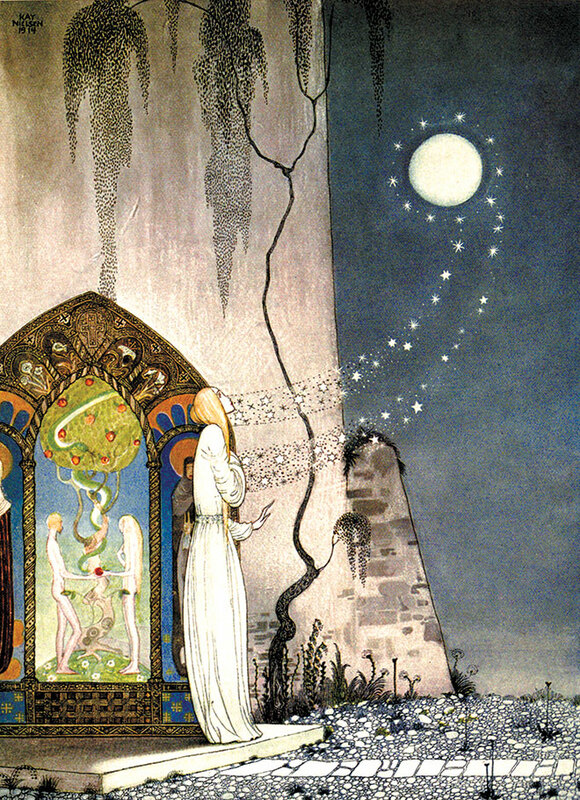 East of the Sun and West of the Moon, Kay Nielsen, 1924. 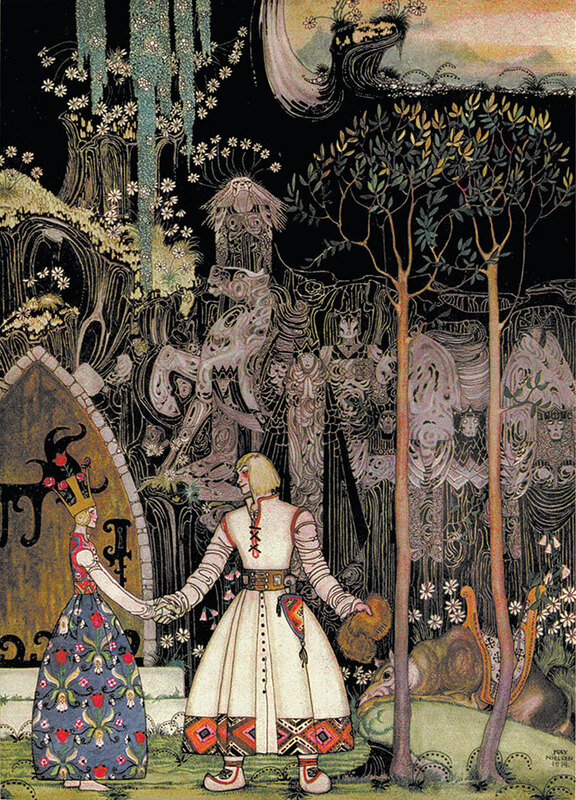 Following his theatrical work in Copenhagen, Nielsen returned to contributing to illustrated books with the publication of Hans Christian Andersen’s Fairy Tales in 1924. This book included twelve colour plates and more than forty monotone illustrations, with the colour images produced in varying levels of ‘formal’ and ‘informal’ border styles – making particular use of the ‘mille fleur’ technique. 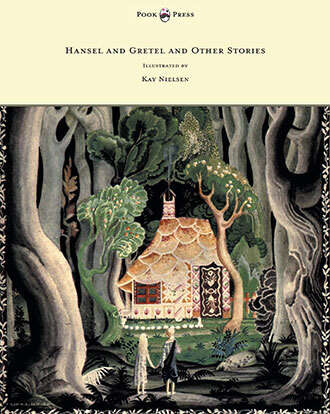 A year later, Nielsen provided the artwork for Hansel and Gretel, and Other Stories by the Brothers Grimm. A further 5 years passed before the publication of Red Magic, the final title to be illustrated comprehensively by Nielsen. The 1930 version of Red Magic included eight colour and more than fifty monotone contributions. In 1939, Kay Nielsen left for California and worked for multiple Hollywood companies. A personal recommendation from Joe Grant (a Disney artist and writer) to Walt Disney secured Nielsen a job with ‘The Walt Disney Company’, where his work was used in the “Ave Maria” and “Night on the Bare Mountain” sequences of Fantasia. Nielsen was renowned at the Disney studio for his concept art and he contributed artwork for many Disney films, including concept paintings for a proposed adaptation of Hans Christian Andersen’s classic story, The Little Mermaid. The film was not made within Nielsen’s lifetime however, and his work went unused until production started on the 1989 film. 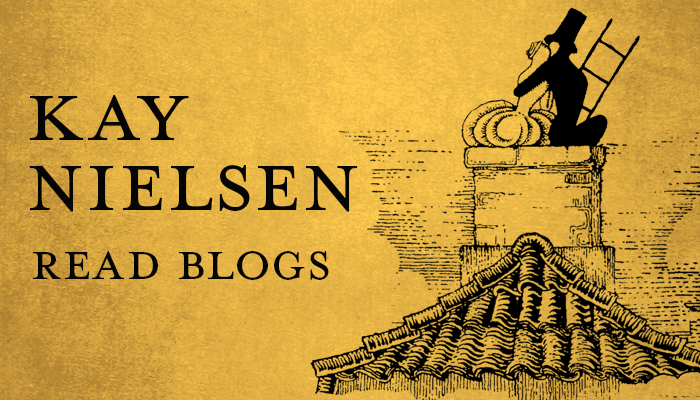 Nielsen was ‘let go’ from the company in 1941 – leaving him distraught. Following this set-back, the illustrator returned to Denmark in 1941, in a state of desperation. He found his works were no longer in demand in Denmark either – and his final years were spent in poverty. Nielsen travelled back to Los Angeles, California, and his last works were for local schools, including ‘The First Spring’ mural installed at Central Junior High School, and churches, including his painting for the First Congregational Church, Los Angeles, illustrating the 23rd Psalm. Around this time, Nielsen contracted a chronic cough that would plague him until his death on 21st June, 1957. He was seventy-one years old. Before her death to diabetes, Ulla gave Nielsen’s remaining illustrations to Frederick Monhoff, who in turn tried to place them in museums. However, none – American or Danish – would accept them at the time. 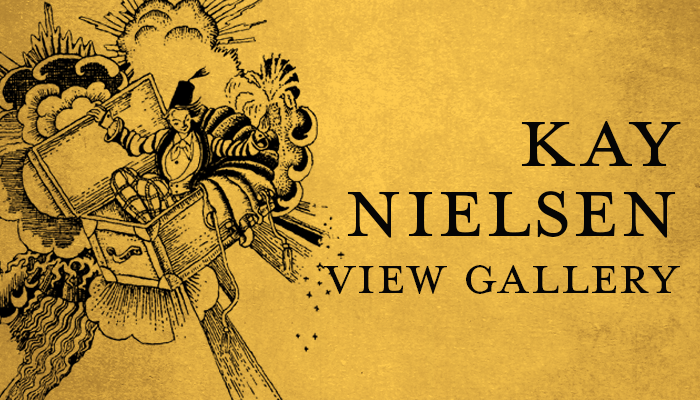 Some of Kay Nielsen’s works (now incredibly valued and much cherished) are in the special collection of the University of Pittsburgh’s Information Sciences Library, and many are owned by private collectors. Hansel and Gretel and Other Stories, Kay Nielsen, 1925.